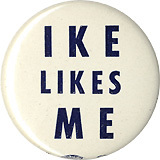 Pinback button promoting Henry Cabot Lodge, Jr. for president, 1964. Litho. 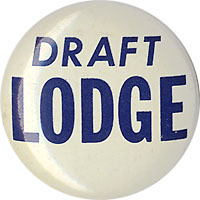 Lodge, 1960 Republican vice-presidential nominee, was later appointed Ambassador to South Vietnam by President Kennedy. 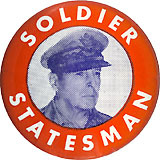 In 1964, while still serving in that post, Lodge was the surprise write-in victor of the New Hampshire primary, defeating declared Republican candidates Barry Goldwater and Nelson Rockefeller. His entire campaign was organized by a small band of political amateurs working independently of the ambassador, and Lodge, believing they had little hope of winning him any delegates, did nothing to aid their efforts. But when they scored the New Hampshire upset, Lodge, along with the press and Republican Party leaders, suddenly began to seriously consider his candidacy. Many observers remarked on the situation's similarity to 1952, when Eisenhower had unexpectedly defeated Senator Robert A. Taft, then leader of the Republican Party's conservative faction. However, Lodge (who refused to become an open candidate) did not fare as well in later primaries, and Goldwater ultimately won the nomination. 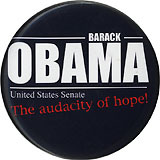 Barack Obama / The Audacity of Hope!